At Belladerm, we LOVE rolling out new products to you and this one is sure to get a lot of buzz. SkinMedica just launched an amazing new duo called The LUMIVIVE™ System. This powerful two-step system is designed to protect skin from blue light and environmental damage. Everyone knows to avoid sun damage but THIS? Chances are this type of damage isn’t on your radar. But did you know that the average person spends around 10 hours in front of a screen daily?! Are you aware that blue light produced by screens actually causes skin damage by degrading antioxidants in the skin? It also increases free radicals that cause aging, dark spots, wrinkles, and saggy or loose skin. 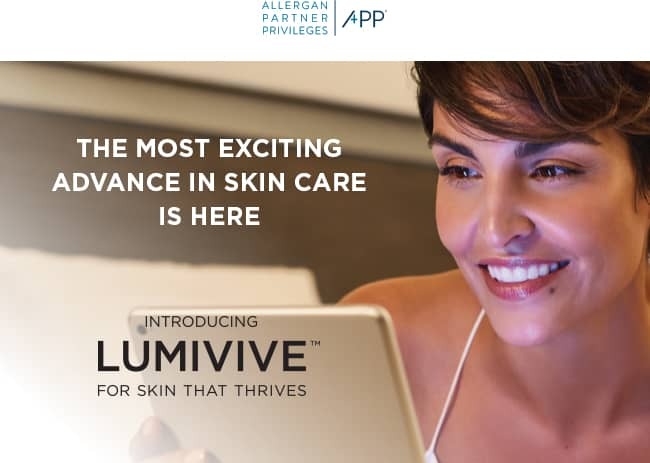 Since aging is accelerated from many modern environmental factors (pollution, blue light, UV rays, heat, etc..) LUMIVIVE™ is designed to protect skin from these external factors. Simply add this to any skincare routine that you already have in place. It is designed for ALL skin types. Defend from environmental aggressors during the day with LUMIVIVE™ Day Damage Defense Serum and revitalize and detoxify at night while you rest with Night Revitalize Repair Complex. Visible results of truly radiant skin can be revealed in as little as 14 days, users have reported. This innovation is a game changer! Click here for more info and check out the special HA5 freebie offer below. The benefits of mineral makeup have drawn many women to it. And it isn’t just hype – there ARE real benefits to using this type of makeup. We’ve gathered the top five reasons that mineral makeup is better for your skin and why you should consider using it, or at least giving it a try! Mineral makeup can be better for sensitive skin because it doesn’t contain perfumes, talc, alcohol, dyes, mineral oil or preservatives. It is believed to be less irritating to the skin. Mineral makeup is a better choice for acne-prone skin. The lack of filler ingredients also make it less likely to cause embarrassing breakouts. Rosacea sufferers have had quite a bit of luck with these products, also. Mineral makeup gives a beautiful, luminous finish. It has the ability to make skin imperfections look better because of the light reflective properties it possesses. Zinc is contained in many mineral makeup formulations. It is known to soothes irritation and provide a light sunblock. Don’t count on relying on your mineral makeup foundation as your sunscreen every day, however. It will not provide you with enough protection to be out in the sun for hours. The coverage mineral makeup provides is lightweight but complete. It is extremely easy to apply. Short on time? Mineral makeup goes on fast and saves you time! We hope this has given you some insight to the many benefits of mineral makeup! We’d love to tell you more in person about how it can benefit you and your individual needs! Drop by this summer when you’re nearby and check out our gloMinerals makeup. See you soon.